At Midwestern Services, Inc., we have committed the resources necessary to train our employees, making them aware of potential hazards and equipping them with the safety equipment necessary to complete each job safely. We are committed to educating our employees through an ongoing safety program and annual refresher courses to keep our employees updated to the latest developments in our industry as well as new OSHA requirements. Our team supervisors are trained in First Aid and CPR and have completed both the OSHA required 40-hour Hazardous Waste Operations and Emergency Response course and the 8-hour Supervisor’s course as well as the required OQ (Operator Qualification) training. 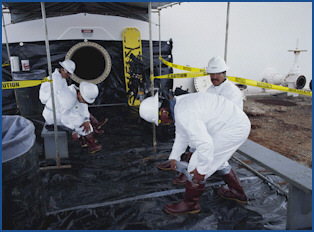 The team supervisor will coordinate with you on any special safety or regulatory requirements your company may have. We want to know our customer’s safety requirements and meet or exceed them. 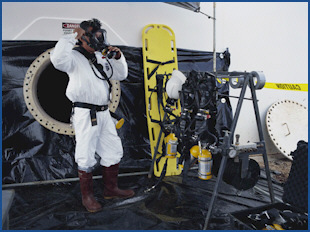 PICS – Pacific Industrial Contractor Screening, Inc.
Providing tank cleaning services is only half the job. Knowledge of safety and environmental issues, government regulations, filing deadlines and the requirements of the many regulatory agencies is equally important. In today’s highly-regulated environment, improper personnel training and improper disposal of waste can lead to serious regulatory problems, liability, and expense. You need to know that your contractor is not cutting corners just to be the low bidder. Midwestern stays current with the regulations pertaining to tank cleaning and the disposal of the resulting waste products. We have an excellent reputation for working with regulatory agencies.